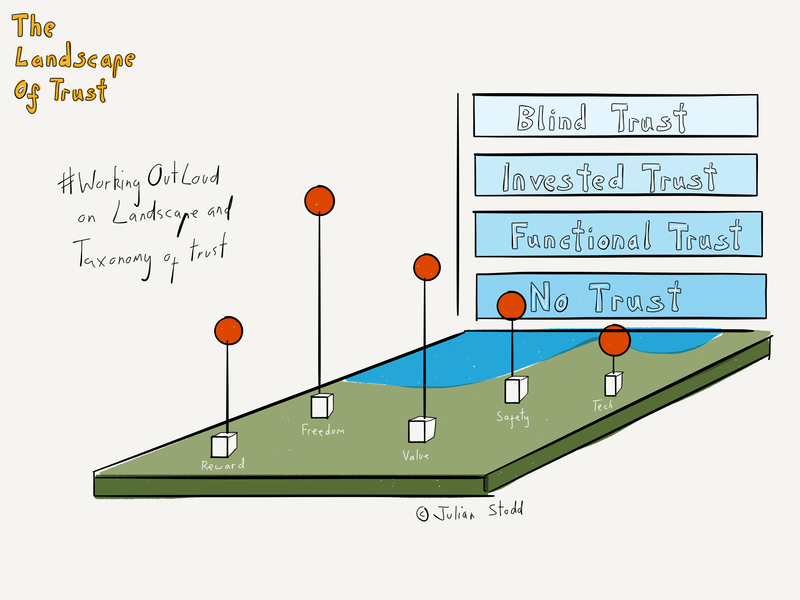 Sharing some sketches as i refine my thinking on the emerging Landscape of Trust, and introduce the second element, the taxonomy, the levels of trust. My current thinking is to map the landscape, through a series of survey and narrative exercises, to provide a space that captures the subjective elements that people associate with trust, and any correlated relationships between them (e.g. the relationship between ‘trust’ and ‘reward’). On top of this, i think there are levels of trust, which i am currently mapping from ‘no trust’ through to ‘blind trust’. All of this may evolve. Once complete, i hope to be able to baseline any organisation or team against a broad data set, with cultural, sector and regional variants. With the baseline, and an understanding of the invested levels of trust, this should provide indicators of development areas: e.g. if ‘reward’ is flagged as having no trust, whilst Leadership has high invested trust, we can consider change accordingly. Specifically, this is not intended to be a ‘trust score’, but rather a heat map, indicating areas that are out of alignment. Nor is it intended to be a mechanistic ‘pull this lever to build trust’ exercise: it is, instead, an exploration of nested subjective notions of trust, and an attempt to put a pragmatic and fair framework around it, to allow us to take practical steps to both reflect upon and earn greater trust within an organisation. This entry was posted in Trust and tagged HR, Landscape, Landscape of Trust, Leadership, Taxonomy, Trust. Bookmark the permalink.